Lady Eve Balfour was the daughter of the 2nd Earl of Balfour and niece of the Conservative prime minister, Lord Balfour. She decided she wanted to be a farmer when she was twelve and became one of the first women to take a degree in agriculture when she enrolled at Reading University College during WWI. By the age of twenty, Eve Balfour was running a small farm in Monmouthshire and looking after a team of Land Girls. At twenty-one she used her inheritance to buy her own farm New Bells Farm, Haughley, Suffolk with her sister Mary. It was a mixed farm with arable crops, a dairy herd, sheep and, at times, pigs. Lady Balfour became an expert at ploughing with a team of horses and became fascinated by livestock breeding. In the 1930s Lady Balfour encountered ideas about compost based farming which led to her putting organic agricultural concepts to the test by conducting a farm-based experiment on her own land. The ‘Haughley Experiment’, in conjunction with her neighbour Ryan Nelson, began in 1939. It was the first side-by-side, long term scientific comparison of organic and chemical based farming. In 1943 she published the results in the best-selling, The Living Soil, which promoted organic farming, precipitating fierce debate. Lady Balfour was one of the founders of The Soil Association, still the major force in organic farming in Britain. 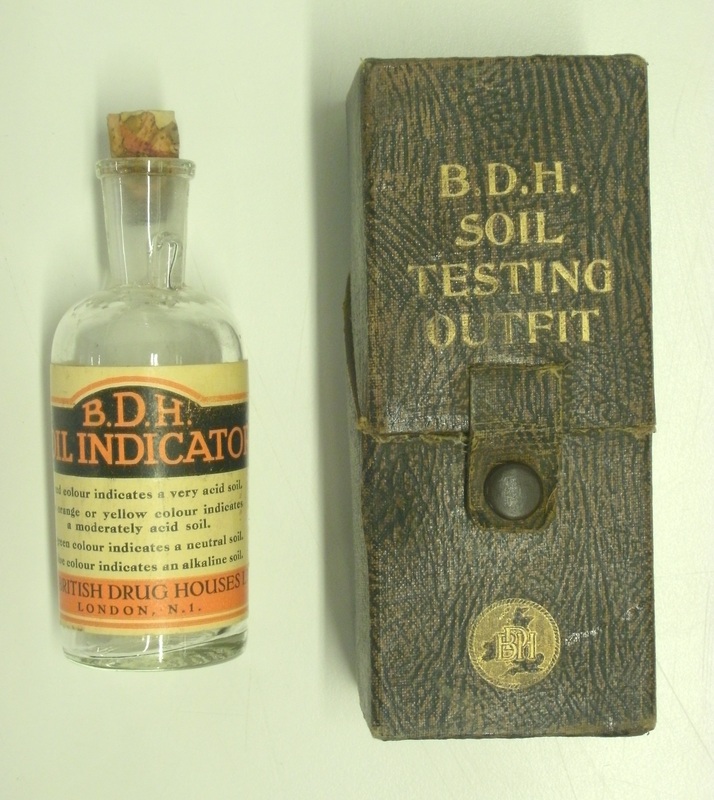 This mid-20th century soil testing kit was made by British Drug Houses and is similar to the sort of equipment Lady Balfour used. A small sample of soil would be collected in the china testing spoon and a portion of “Soil Indicator” poured on it. A colour change indicated acidity or alkalinity, red being very acid, orange or yellow meaning moderately acid and green neutral. A blue colour indicated an alkaline soil.